We Are the premier Akron Car Wash and Pet Wash Facility. We want you as a long-term patron and our aim is to provide you a level of service that exceeds your expectations. If we succeed, please tell a friend or leave us an online review. If we fall short, please tell us and we will make it right! Full-Service Pet Grooming in Akron. Join us on social media for special offers, car & pet information, and more. We are the most versatile Akron Car Wash with the choice of Soft Touch, Touch Free and Self-Serve wash options under one roof. In our Touch Free and Self-Serve Bays, we offer the versatility of washing virtually any vehicle under 96 inches wide and 94 inches tall. Quick Clean can handle not only the family car but also standard trucks and vans, dually pickups, empty ladder rack pickups and vans, light duty tow trucks and even accessorized vehicles. Looking for a truly premium car wash experience for your standard manufacturer equipped vehicle? Visit Akron's newest Soft Touch Automatic Wash bay where options like automatic wheel cleaning, ArmorAll Extreme Shine Wax, and Rain-X are available. 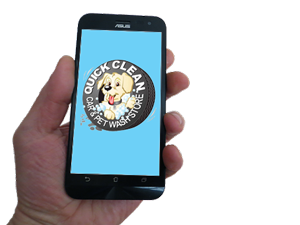 Be sure to visit your favorite app store to download our NEW Quick CLean Car & Pet Wash App. It’s free!